What better way to kick off Spring than with a brand new bed? 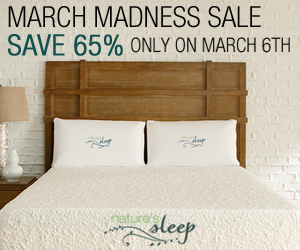 Springtime is here and it is time for the March Madness Sale at Nature's Sleep! Everything on their site is 65% off the entire purchase*. The sale starts at midnight tonight and is only for 24 hrs ! 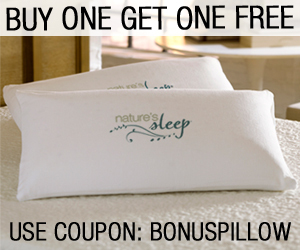 Ends at March 6 at 11:59 EST. That is a whole 24 hours to get 65% OFF memory foam mattresses, memory foam pillows, memory foam toppers, memory foam slippers and even dog beds! So replace your old mattress with a new memory foam mattress, and toss out your lumpy pillows and swap them for memory foam pillows for less.